IRVINE, Calif. /California Newswire/ — 5 Bars, an Irvine-based premier provider of indoor and outdoor distributed antenna systems (DAS) and Wi-Fi® systems, has installed permanent neutral host DAS and Wi-Fi networks at Angel Stadium of Anaheim. Angel Stadium is a 45,483 seat facility and home to the Los Angeles Angels of Anaheim. Fans in attendance at Angel Stadium will now experience a profound difference in wireless connectivity and data speeds. As the official provider of wireless networks to the Angels, 5 Bars designed and engineered the network to meet and exceed Major League Baseball Advanced Media (MLBAM) requirements and specifications parameters. In order to ensure five-bars of cellular coverage and superior cellular capacity for Smartphones, 5 Bars has deployed over 400 antennas for the DAS, manufactured by JMA Wireless. Currently AT&T and Verizon are on the network with other carriers expected to join soon. 5 Bars owns and operates the DAS and Wi-Fi network infrastructure at Angel Stadium and installed over 300 Ruckus Wireless high-capacity Smart Wi-Fi access points with the latest "state-of-the-art" technology to give a new generation of fans the most cutting edge connected experience. 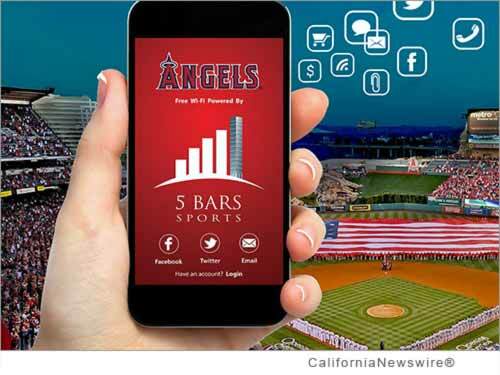 5 Bars Media, in partnership with the Angels, will be offering mobile applications over the Wi-Fi network which will enhance the fan experience. "We want to bring the best possible Major League Baseball experience to fans attending our games, and we're confident this new, high-performance Wi-Fi network will fully meet those expectations when our fans come to Angel Stadium," said John Carpino, President of the Angels. "Delivering wireless performance within high-density public venues such as stadiums has been a major challenge across the industry, but one that we believe is essential to solve in order to attract and retain fans who now demand the fastest, most responsive and reliable wireless connectivity possible," said John Clarey, President and CEO of 5 Bars. Angel Stadium has been awarded a 5 Bars Certification, recognizing the highest standards of wireless connectivity with the most technologically advanced coverage and capacity. Fans with smartphones and tablets can seamlessly connect to the network through a simple log-in, and use of the Wi-Fi service is free to the user. Wi-Fi data usage does not count toward users' monthly smartphone data plans, offering fans the ability to surf the web, update their social networking sites or upload and send photos to friends without worrying about their monthly bill. 5 Bars held company and provider of commercial indoor and outdoor neutral host distributed antenna systems, small cells and gap-free Wi-Fi networks. 5 Bars works with venue owners to design, build, operate, monetize and maintain "state-of-the-art" seamless wireless networks with world-class infrastructure, while enhancing the fan experience and wireless connectivity.